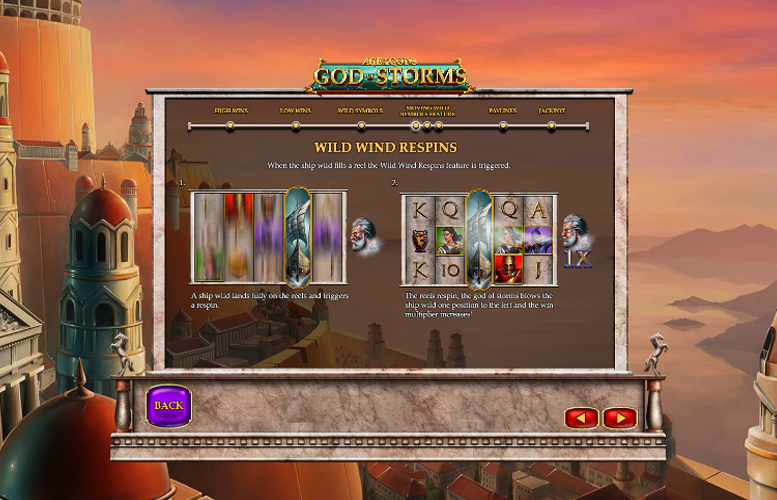 Age of the Gods: God of Storms is a well-designed slot machine that has a strong look and feel to it. The artwork is tastefully done and the animation during the game’s primary feature gives the title character. The re-spin feature is also thematically relevant and there’s a progressive jackpot that can be dropped too. Unfortunately, the title does suffer from a lack of diversity when it comes to its features. The omission of a second screen bonus or free spins mode is noticeable, particularly on subsequent visits to the slot. Strong look and feel. We particularly enjoyed the art style of Age of the Gods: God of Storms. Innovative main feature. The moving stacked “wild” isn’t something we’ve seen before. Progressive jackpot. We love the opportunity to win a huge prize from a 1p spin. Lacking in diverse features. Whilst we did enjoy the game’s main feature, there is little else to keep players engaged. Therefore, the replay value of this title is somewhat lacking. This game has a progressive jackpot attached so technically the top jackpot is unlimited – at the time of writing it stands at £100,000.81. Red warrior = 500x the line bet. Green or Purple Warrior = 250x the line bet. Dragon or Urn = 150x the line bet. When the ship “wild” fills a reel, the Wild Wind Respins feature is triggered. 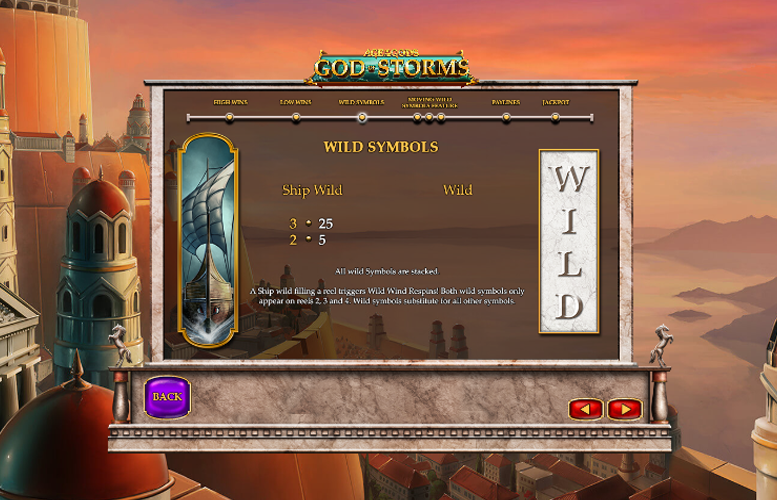 During this re-spin, the god of storms blows the ship “wild” one position to the left and the win multiplier increases. Re-spins will continue to occur until the ship “wild” has been blown off the reels entirely. Each subsequent blow of the god of storms continues to increase the multiplier. The final re-spin occurs with the ship “wild” being blown off the reels entirely. The win multiplier can reach up to 5x. 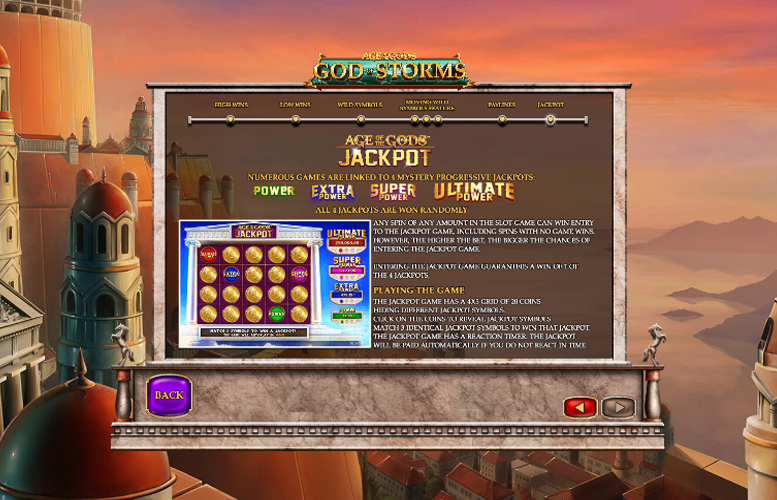 Numerous Age of the Gods slot machines are linked to four mystery progressive jackpots. These are known as: Power, Extra Power, Super Power, and Ultimate Power. Any spin of any amount during gameplay can trigger entry into the jackpot game. This includes spins in which no prizes are won. However, the higher the bet, the larger the chance of entering the jackpot game. Each time the jackpot round is triggered, one of the prizes must be won. To play the game, players must pick from a grid of 20 coins. Behind each of these is one of the jackpots. Players must match three of the same jackpot types to be awarded with that prize. The largest of these can each truly life-changing sums of money. King or Queen = 75x the line bet. Jack or Ten = 50x the line bet. 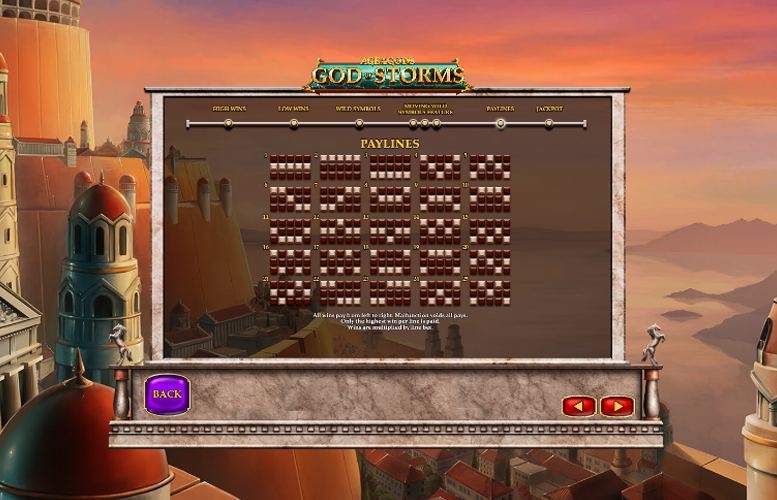 Players can vary the number of win lines bet on Age of the Gods: God of Storms. The minimum here is just one and the maximum is 25. Meanwhile, they can also adjust how much money they bet on each too. Here, the minimum line bet is just 1p and the maximum is £10. 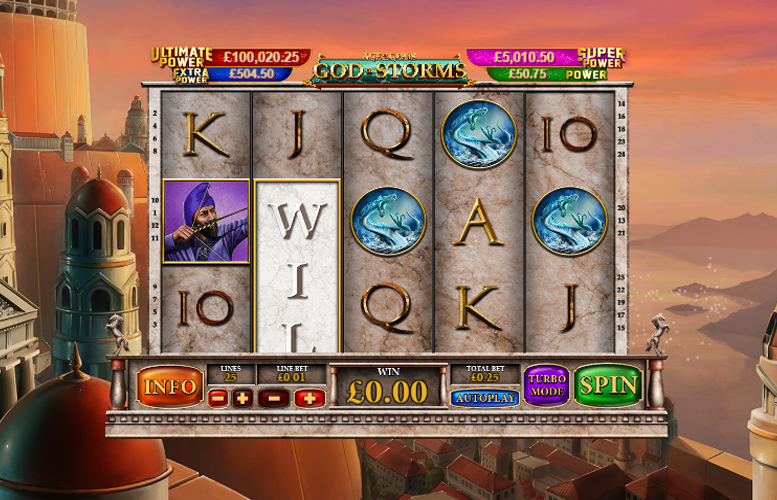 This makes the lowest possible bet per spin on the slot 1p and the highest £250. All told, Age of the Gods: God of Storms is a decent game. It’s by no means amazing but fans of innovative bonus features will at least get some enjoyment from the re-spin bonus. However, the fun probably won’t last long since the title lacks additional features. However, if slots based on pseudo-mythology or progressive jackpots are your thing, you’ll likely enjoy the game. This game has a rating of 5 / 5 with 327 total reviews by the users.